TypeFacet Autokern is a free and open source set of Python routines, created by Charles M Chen, that aims to let type designers automate much of the spacing and kerning processes. Typefacet info, git source, downloads etc is found here. Even though the project is an early work in process the results seem very positive. 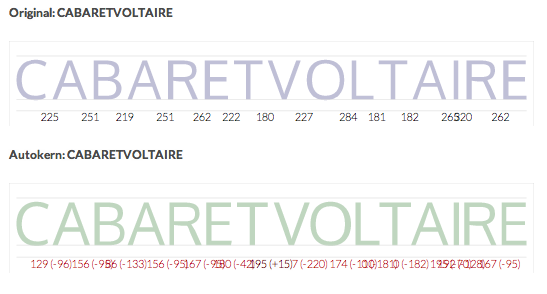 For example, below, screenshot of font in progress ‘Bench12′, before any spacing has been built, and then after running once through Typefacet. At the moment Typefacet is producing the spacing in the screenshot above by adjusting side bearings, but also by creating lots of kerning pairs. 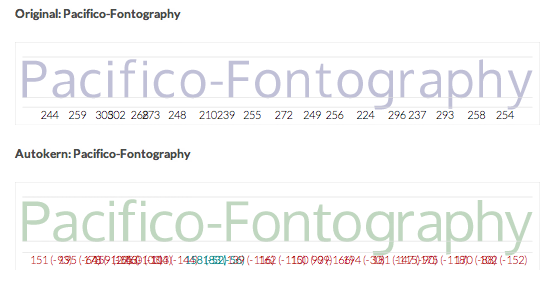 Spacing a font by creating a huge amount of kerning pairs is not an ideal or elegant solution, however, by fine tuning the parameters that Typefacet uses, it is possible to use the tool in a much more targetted way. For example, Typefacet can be run to only adjust side bearings, or, to only adjust kerning pairs, or both at the same time. 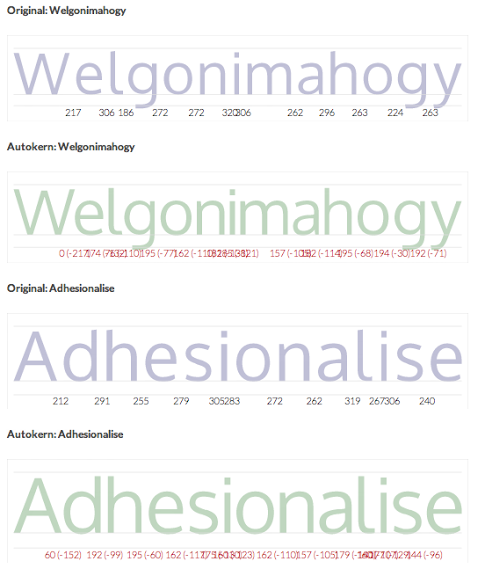 The font weights in the screenshot below have been autospaced only by Typefacet, with kerning pairs to be added later. This means spacing and kerning can be targetted separately. Additionally Tyefacet can be run to only adjust certain glyphs or pairs of glyphs, or to ignore whole categories of glyphs. This allows much fine tuning and the targetting of relevant pairs only. For example in the screenshots below, typefacet was run initially to target side bearings only (no kerning), then the relevant glyph pairs were targetted for kerning. ‘–kerning-threshold-ems’ discards kerning values less than this value. ‘–max-kerning-pairs’ only retains the N largest kerning values and discard the rest. The full Typefacet Autokern manual can be found here. These parameters give the following results, which are still relying on too many kerning pairs, but progress is in the right direction. Next Post Next post: Finding Web Developers in Montreal: A Daunting Task?